Chinchillas can make the perfect pet for many. They are still exotic, given how few are kept as pets, but you might not find a cuter animal. Chinchillas have the thickest fur of any animal. You might not find anything softer in existence! And even though they have such a luxurious fur they don’t produce any pet dander – the cause of most pet allergies. Don’t expect your chinchilla to cuddle with you. This is possible with a great deal of time and effort, but chinchillas prefer to be exploring and bouncing around whenever they are awake. You’ll need to provide an area outside the cage that they can visit on occasion. This might not be easy, as they can jump up to five feet high! Chinchillas are rodents, so their teeth are constantly growing. To keep them worn down they will chew on anything: furniture, electrical cords, walls… You can limit the damage by providing quality chew toys (pine, apple branches, pear branches) in their cage at all times. Chinchillas won’t bite unless they feel threatened. Another fun thing to watch are chinchillas clean themselves by rolling in “dust” (really ground pumice)! The dust will make its way all over your house, but it’s how they keep clean and amazing to watch. They are quite intelligent, able to recognize voices and simple commands (with practice). Chinchillas sleep during the day so they need a quiet environment. A lot of activity and yelling can cause your pet to get stressed. They are well suited to a person or family who works during the day and wants a playmate when they come home in the evening. Chinchillas like the dark, though, so don’t keep them in your bedroom! Chinchillas don’t have any odor, but you do have to clean their cage weekly. They need a cool room (under 75 degrees) in which to live. High temperatures can cause a heat stroke (imagine you lived in a fur coat!). Chinchillas are relatively inexpensive to keep. You’ll have to buy a fairly large cage, but the food, dust, and hay are readily available at any quality pet store. They may never need to see a vet. If your chinchilla gets comfortable enough with you they will jump on your lap and shoulders. With enough attention they could become one of your best friends. Tristan Miller has owned chinchillas since 1990. 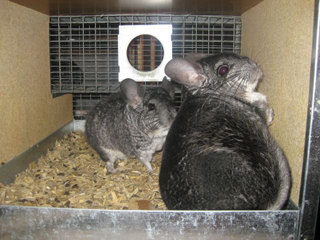 You can find out much more about chinchillas at The Chinchilla Source.